Another 45 on the Louisiana Golden label. 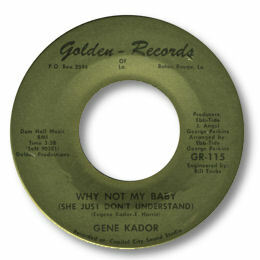 Although the singer’s name on the disc is Kador’s it’s not difficult to spot the involvement of George Perkins in this one. The chord structure is very similar to “Cryin’ In The Streets” and who else could the high tenor in the background be except Frank Turner from the Silver Stars? Despite all this Kador puts in a fine performance on Why Not My Baby particularly on the fiery preaching rap in the middle section. I wonder if this guy is any relation of Ernie K-Doe (Ernest Kador)? UPDATE ~ The indefatigable Greg Burgess writes to say "Gene Kador is his brother. He is now the Bishop Eugene Kador at the Moses & Elisha Spiritual Church in Port Ellen, Louisiana." Thanks to Ben the Balladeer (see Links) for the suggestion and to Greg the Researcher for info.